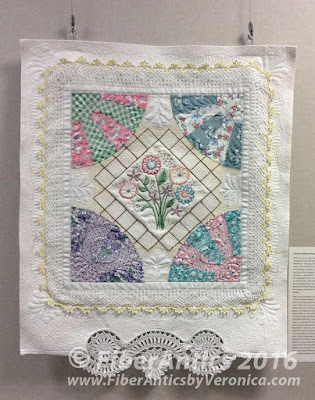 Fiber Antics by Veronica: Have you seen "Dressed" yet? 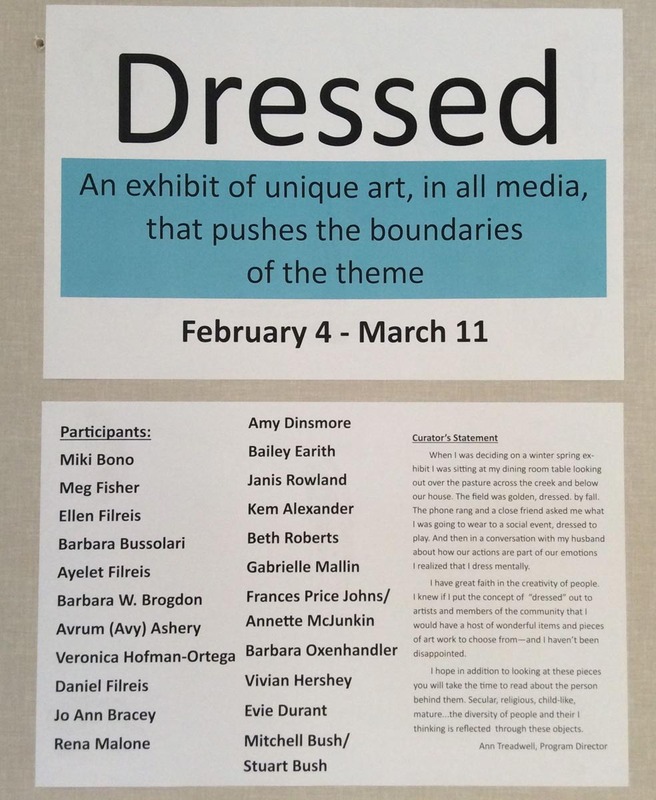 It's not too late to see the "Dressed" exhibit in Chattanooga. This multi-media exhibit is on display until March 11 at the Jewish Cultural Center. 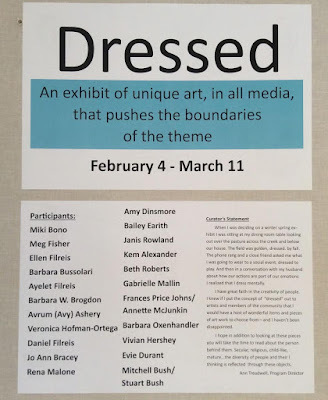 The exhibit includes my piece, "Bedroom Dressings," and the work of 23 other artists that explored the theme in textiles, fibers, paper, oils, acrylics, watercolor and mixed media. And it is free admission! My husband, family and friends attended the lovely opening reception in February with me and we got to meet a few of the other artists. 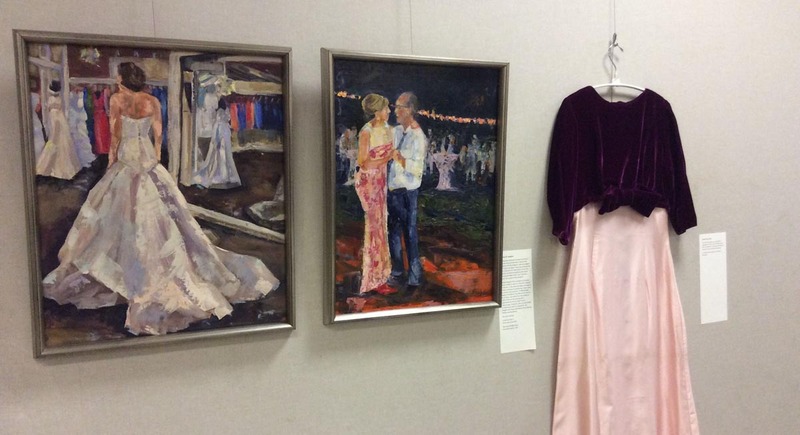 Kudos to Ann Treadwell, Program Director for the Cultural Center, for curating a beautiful exhibit. I posted details about my piece, "Bedroom Dressings," here along with close-up photos of the materials and free-motion quilting, and the quilt stats. The piece is a collection of orphan quilt blocks, an unfinished embroidery, a vintage dresser scarf and a lace-edged pillowcase, appliquéd and free-motion quilted. 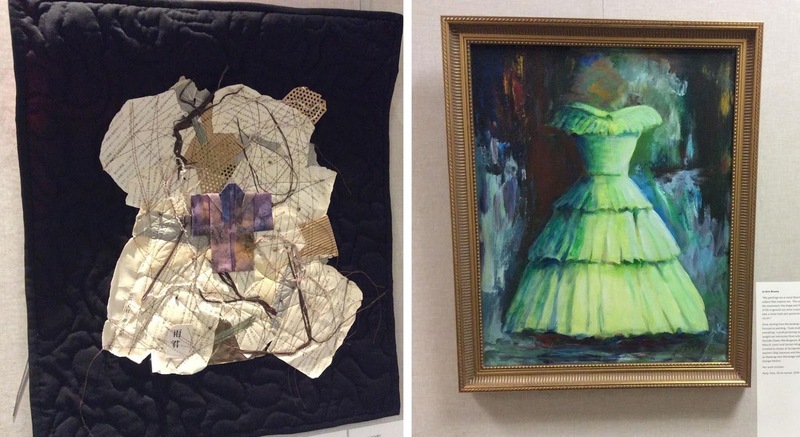 And here are a few pictures from the opening reception. 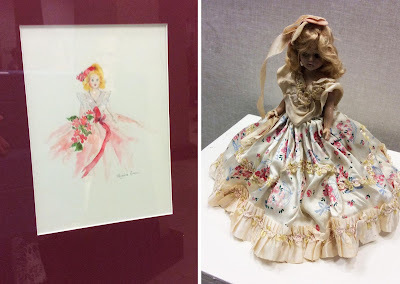 They don't do justice to the art, so go and see the exhibit in person. and a handmade evening gown, 1960s, by Frances Price Johns. Larry won one of the door prizes—a bottle of wine—and I got to wear my reconstructed Tablecloth jacket that I created in a "Garments: Deconstruction/Reconstruction" workshop with Angelika Werth last year. It was a delightful evening all around! 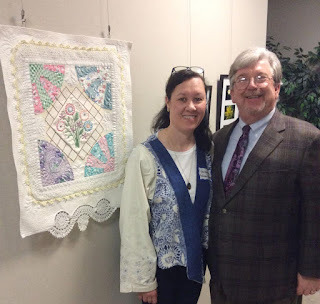 My piece, me wearing my Tablecloth jacket, and my husband, Larry.